Its always fun to make something for your kids. Its even more fun if you involve them and cook something. 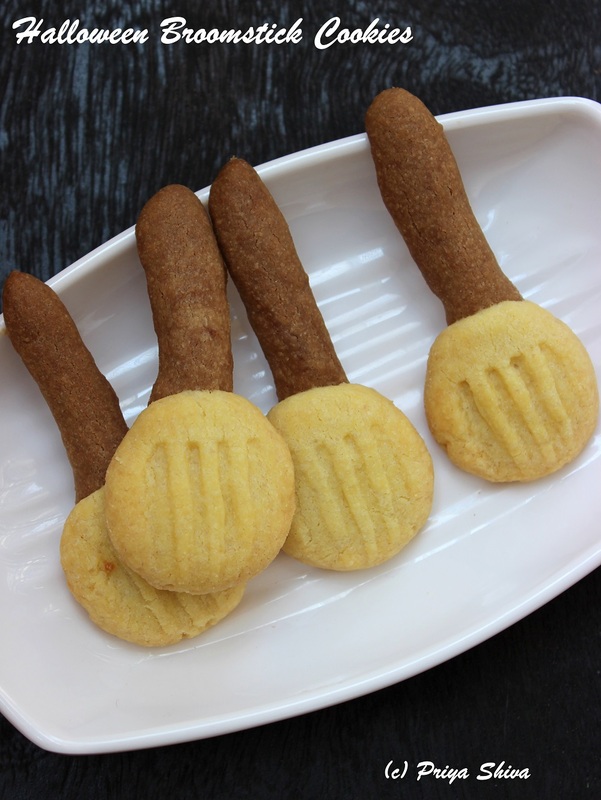 I decided to make some Broom stick cookies for this Halloween. 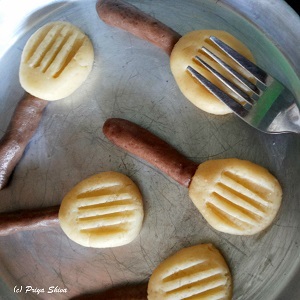 Last time I had made some eggless witch finger cookies and my kiddo totally enjoyed making them with me. I can do anything to just see him smile. After all children fill our lives with so much joy 🙂 .. 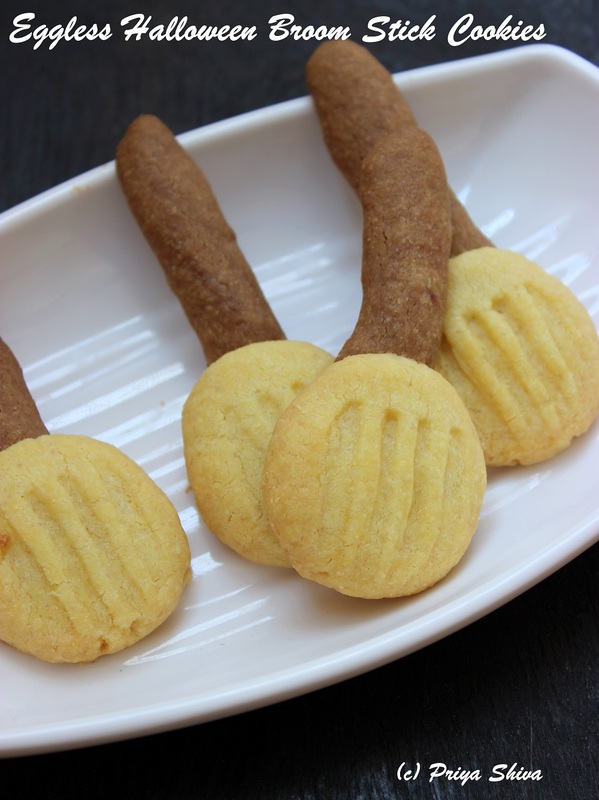 These cookies are so easy to make with 4 basic ingredients. They are shortbread cookies and I have added cocoa powder to differentiate the colour of the stick. Make some easy, eggless shortbread cookies for this Halloween! Sift all purpose flour and keep it aside. Add butter at room temperature and sugar in a bowl and mix well. Now add all purpose flour, milk, salt, vanilla essence and mix well with your hands to make a soft dough. Take a small portion of dough and mix cocoa powder and milk with it to make sticks. Keep this chocolate dough separately. Take a small portion of vanilla dough and flatten it gently with your hands and place it on cookie tray. Keep at least 1/2 inch distance between each cookie. Press the cookie lightly with the help of a fork to make lines. 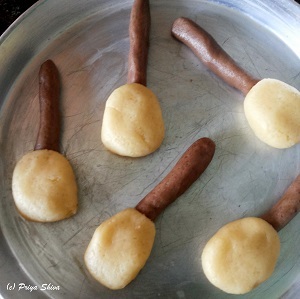 Take a portion from chocolate dough and roll it to shape like a stick. Fix it one one side with vanilla cookie dough as shown in above pictures. Preheat oven at 180 °Celsius. Set the timer for 15 minutes and place the cookie tray for baking at the same temperature. When the edges start turning light golden brown, remove from the oven and place them on wire rack for cooling. When they have completely cooled down store them in an air-tight container. You can also dip them in chocolate syrup and enjoy.